Radio image at 843 MHz of the supernova remnant G318.2+0.1 (Whiteoak & Green 1996). The on-going H.E.S.S. Galactic Plane Survey continues to reveal new sources of very high energy (VHE) gamma rays. In particular, recent re-observations of the region around the shell-type supernova remnant (SNR) G318.2+0.1 have resulted in the discovery of VHE gamma-ray emission from an extended region. G318.2+0.1 (top image) is a large diameter (40′′×35′′) shell-type SNR discovered in the Molonglo Observatory Synthesis Telescope (MOST) survey (Whiteoak & Green 1996). The remnant is characterised by two non-thermal filaments in the Northwest and South- east which form two sections of a shell, and a central region of thermal emission which corresponds to a HII region. The SNR also contains hard X-ray sources (Boccino et al. 2001) suggestive of non-thermal electron acceleration. Combining particle acceleration and gas clouds serving as production targets, G318.2+0.1 is a promising target for VHE gamma-ray observations. The region of interest was observed with the H.E.S.S. telescope array between 2004 and 2010. The dataset - a total of 102 hours - is primarily comprised not of dedicated observations but rather of survey observations of the region and of observations of nearby sources. A highly significant signal - HESS J1457-593 with about 9 standard deviations - is detected (Fig. 1), slightly offset from but overlapping with the remnant. The (rms) source size is about 0.3 degr. by 0.2 degr. 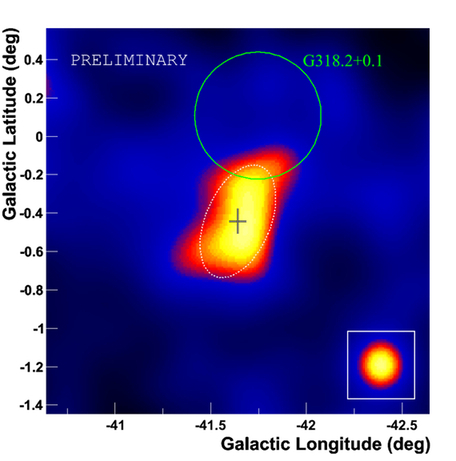 The offset location of the VHE gamma ray source and the remnant - assuming that they are related - could be explained by molecular clouds just outside the remnant, illuminated by cosmic rays accelerated in the remnant. In searching for molecular cloud counterparts, CO radio data from the Dame et al. survey was analyzed. In a velocity range centered around -42 km/s, a 1.8 degr. by 1.1 degr. 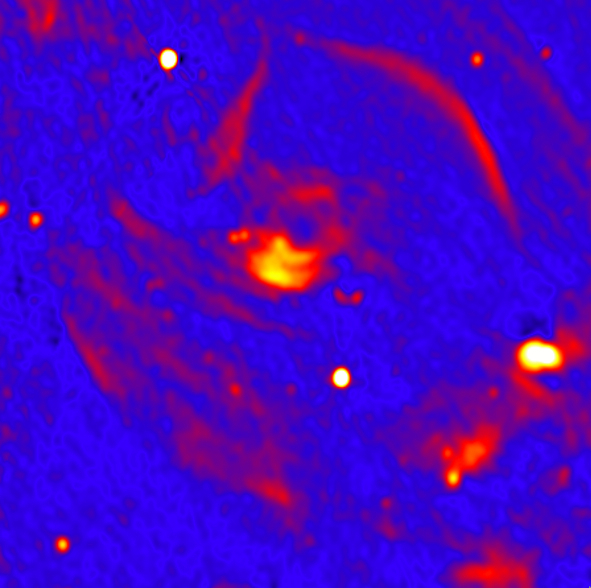 cloud complex encompassing the VHE gamma-ray source is found (Fig. 2). This velocity corresponds to a distance of either 3.5 kpc or 9.2 kpc; the mass of the molecular cloud is about 3 x 10^5 or 10^7 solar masses, respectively. At a distance of 3.5 kpc and with an angular size of (40′′×35′′), the remnant would have a physical diameter of roughly 40 pc; a similar value of 50 pc is estimated in Boccino et al. 2001. Assuming an ambient density of 1 particle/cm^3, the age of the remnant can then be estimated from its size; one obtains an age of about 8000 years, consistent with a remnant in the late Sedov phase which is an efficient particle accelerator but is already leaking high-energy particles into the ambient medium. Fig. 1: Very high energy gamma ray image of HESS J1457-593. The cross indicates the source center, the dashed ellipse the source size. 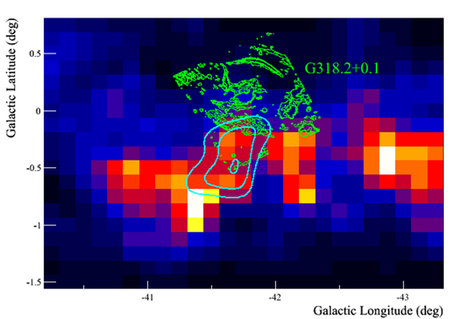 The green circle indicates the approximate extent of the SNR G318.2+0.1 in radio. The inset shows point spread function, i.e. the response of the instrument for a point source. Preliminary. Fig. 2: Map of the CO line emission around HESSJ1457−593 integrated between −54.5 km/s and −32.5 km/s. Overlaid in turquoise are the contours of HESSJ1457−593. Shown in green are the radio contours (843 MHz) of the SNR G318.2+0.1. Preliminary.